Prevents Syrup From Fermenting - Syrup with HiveAlive added can be stored until next season without fermenting. In addition, syrup fed to hives that is not consumed before winter comes will not ferment in frames or cause dysentery. HiveAlive activated syrup stored in frames will actually help clean the frames. 100ml enough for 40 litres of syrup at 2.5ml/litre. HiveAlive contains a blend of unique seaweeds, thymol and lemongrass scientifically selected for honeybee health. 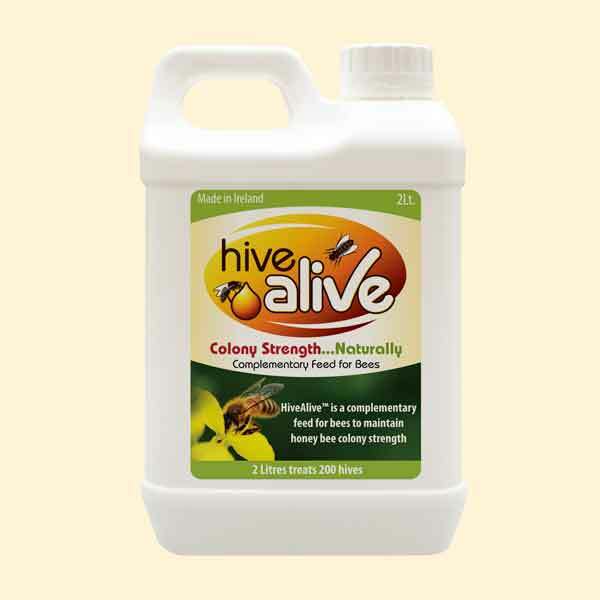 Published results show an 89% increase in colony population when HiveAlive is added to syrup. International field trials show a 40% increase in honey production when HiveAlive is fed. Proven Safety & Efficacy- You can rest assured that HiveAlive has been manufactured to the highest standards and extensively tested to ensure a high quality, reliable solution to your beekeeping needs. The ingredients and manufacturing process for HiveAlive conforms to EU animal feed regulations and is FDA compliant. 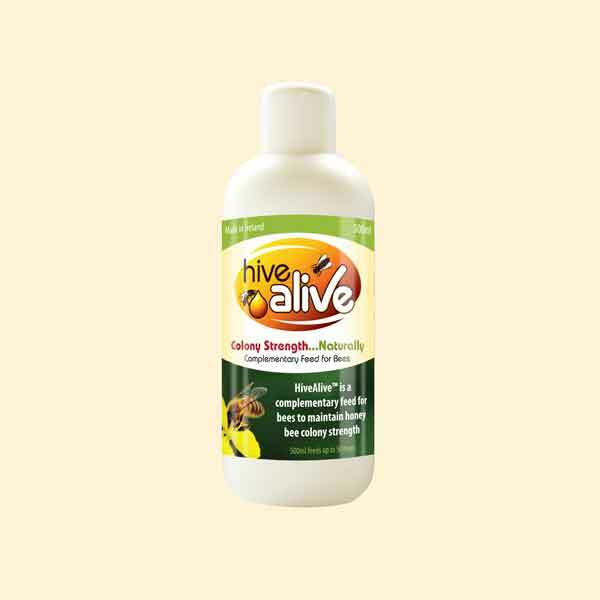 Natural, Active Ingredients - HiveAlive was developed specifically for honeybee health and contains a unique blend of seaweed extracts as well as thymol and lemongrass oil. Increase colony populations - Year on year, colonies treated with HiveAliv are stronger, more productive and are better able to defend against disease. 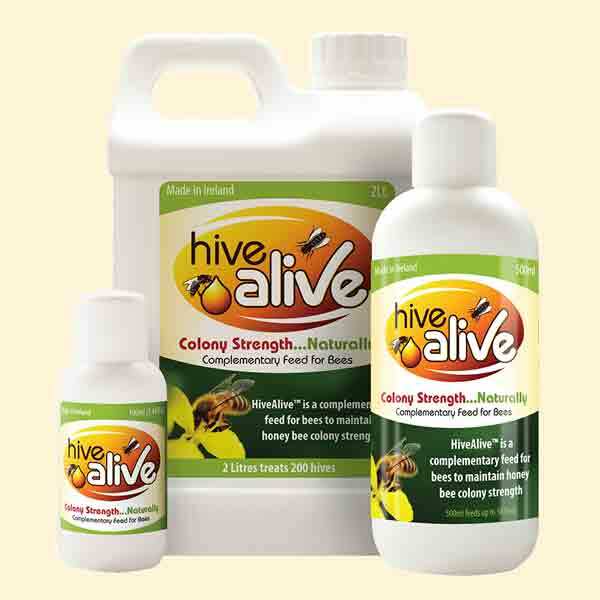 Feeding HiveAlive also reduces overwinter mortality and maintains low disease levels. Promote Intestinal Well-being - Seaweeds have been shown to possess prebiotic activity meaning they have the ability to promote the growth of beneficial/probiotic bacteria found in the gut. Seaweeds also exert a protective effect on the gut, allowing increased protection from pathogens such as Nosema. Trials show reduced Nosema spore levels when HiveAlive is fed. Easy to use - 2.5ml HiveAlive can be added to 1 litre of syrup for feeding to bees. It can also be added to syrup for drenching colonies. Aid New Queen Acceptance - Spray/drench the hive with HiveAlive activated syrup to aid new queen acceptance. For a cleaner, healthier hive - Spray/Drench HiveAlive activated syrup for a cleaner, healthier hive and to revitalize bees underperforming, weak or not feeding, ideally once a week for 3 weeks to cover full breeding cycle. Spring is the best time to do this. Limit bearding/absconding when introducing thymol based miticides - Feed HiveAlive activated syrup 1-2 weeks before administering thymol based miticides to limit the possibility of absconding/bearding.